HEIScope MZ Micro Zoom Microscope CCD Coupler standard C-Mount design is suitable to 1/3" CCD or USB Cameras, in which three magnifications, i.e. 0.5, 0.75, 1.0X, 1.5X, 2.0X adopting with "far-take" optics structure that greatly shortened the length of the system. 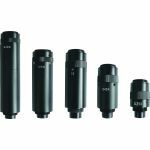 Purchase a HEIScope MZ Series CCD Couplers sold by Howard Electronics Today!